Mhhh, this must be a css problem. That’s an issue I will try to fix for the next version. Thanks for your support. I did it for my handball club and think it may be useful for other people. My idea was to keep it quite simple. In fact, I didn’t manage to reproduce your problem on my side. I received comment from other users of the plugin and they didn’t have the problem either. So I’m thinking that it is caused by your personal template of your blog. If it’s the case, there’s nothing I can do for you. Maybe you should investigate on your side. You where right, it works now with a different theme. The problem exists with every theme that i make when i use Artisteer software. Is there an easy whey to change the colors inside the result table ? @Dimitri: to change color inside the result table, you need to edit lightbox.php: line 48 and 51. I will try to facilitate that for the next version of team results. @GroG: Hi, sorry about this issue. Noone told me that he is having the same problem. On which database is your wordpress hosted? What about a season option beyond game type and teams in the database. It is VERY CRITICAL after the sport season ends and a new one starts. You must add that option before we apply more data. Thank you again for doing that excellent work !!! first i wana thank you for that result plugin. i use it for my esport team. but i have a question. where can i make the words smaller or bigger? cause i want that all the infos exept date is on one line. just as one of your screens. on my blog the result is on more then one line. can you help me please? Hi, Thanks for your support, I’m working on a new version. If you want to reduce the score size : Team1 12 – 13 Team2, you should reduce the font-size parameter: line 435 on misc.php. On team_results.php : remove « br / » line 96, 98, 104 and 106. It’s the br / that is before .$games[‘game_type’] that you must remove. Hope that’s help. Bonjour, je cherche la traduction de ce pluging en français, serait il possible de l’avoir? Hi, thank you for the widget. It is exactly what I needed. I have some problem with the display. It has made my footer out of place. Also the date font and spacing is quite large. How to I reduce the size. thanks again. For your footer issue, I won’t be able to help you as this is a theme issue. désolé de reposer la question : comment faire pour tout mettre en FR ? Renomme le fichier TeamResults-fr_FR.po en TeamResults-en_EN.po et vire le fichier anglais d’origine, ça devrait traduire le plugin. Cette solution n’est pas très propre mais devrait marcher. Si ca ne marche pas, essaie de changer également le fichier .mo situé dans le même dossier. Désolé mais j’ai effectué les modifs proposées, mais sans succès. 🙁 Une idée ?? je trouve l’idée du plugin intéressante mais pour mon utilisation j’aimerais pouvoir présenter le match la semaine précédente. En fait que l’affichage soit : ‘samedi 28 aout – Equipe1 VS Equipe2’ et que le soir du match j’ajoute le score. Le score reste affiché jusqu’au lundi soir et hop le prochain match se présente et ainsi de suite. Ah oui, aussi, il serait cool de pouvoir entrer tous les matchs connus à l’avance et aussi charger les images des logos des équipes. Ce sont des idées pour faire avancer ton plugin. Penses tu qu’une adaptation soit envisageable ? I like this app a lot. I wonder if there’s a way to make it work for golf scores though? I would like to have a list of the top 10 golf scores in a tournament, with no « vs ». Any idea how this could work? Hey I just added your plug in but I can’t figure out how to program in the teams and stuff. Sorry, I’m really new to this whole website thing! Sorry for the late answer, I was busy those days. @Erika: If you activated the plugin, you should have a new menu at the bottom called « Team Results ». There you must create team first and then add result to a specific team. Let me know if you’re having specific issues. Can the widget be used as a plugin so that it appears in a post? For now the plugin don’t have that functionality but your idea is good. I will try to add it for the next release. Can you explain a bit more what you did? You saved a result, update something (like the score) and then you saved and the date went wrong is that correct? Date shall not be able to change? Mika :@Ulf Date shall not be able to change? The plugin has developed a problem. It has been working fine all year but now the date is refused and all new games are listed as being played on 01/01/70. How can I fix this? I have tried editing the date afterwards but it still reverts back to 01/01/70. Thanks for your feedback. It seems that there’s an issue with the date on that release. I will try to fix that as soon as possible to publish a new release. it is a pity that I can´t use the plugin team results for our homepage of my soccer club. No results can be saved, they are not listed down, only the very first team I could save, after trying again through erasing and uploading again it doesn´t work anymore. Is there any possibility to help? hey! why isn’t it showing me colors when i check the full table? I found that you have to delete all spaces after the date! when you click on the text box it goes somewhere in the middle, like there were a lot of spaces in between and as soon as i deleted them – everything worked fine! faut-il ajouter qqch dans le code de la page team_results.php ? I think that your pluggin Team Results is fantastic and is just whta we have been looking for, Thank you. 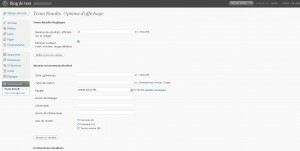 We have just started converting a statick html site into a wordpress site for our rugby club. We are using WordPress 3.2, and it does not seem to work correctly 🙁 do you have any plans to update your great pluggin? 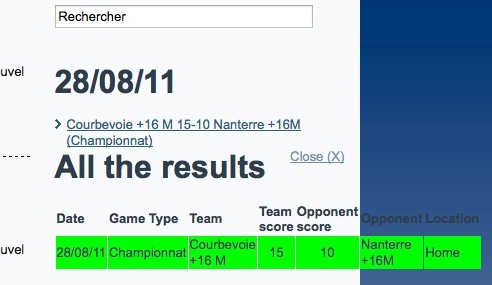 Team Results semble être à l’abandon mais pour ceux qui veulent une alternative il y a http://wordpress.org/extend/plugins/leaguemanager/ qui est assez actif et complet. Le plugin n’est pas à l’abandon, c’est juste que faire des plugins gratuits ne me permet pas de gagner ma vie. Du coup je le met à jour quand j’ai du temps, la dernière maj datant de juin. Je n’ai pas encore testé WordPress 3.2. Si le plugin s’avère incompatible avec cette version, je vais essayer de rapidement faire une MAJ pour corriger ça. How come TeamResults-nl_NL.mo and TeamResults-nl_NL.po aren’t used as display language ?